St. Louis, MO - John Harder & Company has relationships with forklift dealerships across the country as well as all the lift truck manufacturers. 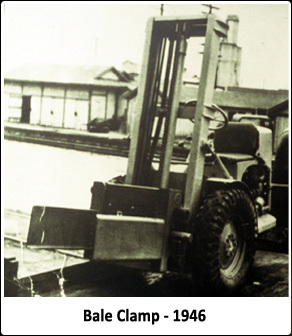 John Harder developed one of the first cotton bale clamps for use on a farm tractor in 1946 at Atlas Trailers and Mufflers in Houston. This stimulated an interest in designing special attachments for the developing lift truck industry. John left Houston in 1950 and started an attachment company in St. Louis called Universal Clamp. Here, John developed many more attachments as the industry grew. In 1960 John sold Universal Clamp to Little Giant Products in Peoria, IL and worked there until 1963. At this time John moved back to St. Louis to join Hydraulic Machine Company (HMC), an attachment company founded and owned by engineer, Ken Frees. Ken had worked with John in the 1950’s at Universal Clamp. Hydraulic Machine Company went on to become a major attachment manufacturer with a focus on standardized attachments. John worked for HMC until 1968, at which time he left to start a specialized attachment company, John Harder & Company (JHC). Ken Frees eventually returned to work with John and still provides engineering consultation to the company. In 1980, John hired Mike Peterson, (then with McDonnell-Douglas Corporation), to become part of the company’s engineering and sales team. Mike went on to become president, owner and chief engineer of John Harder & Company, Inc. and continues today in this role. With the group that John assembled, the company established relationships with forklift dealerships and lift truck manufacturers around the globe. Today, John Harder & Company continues with John’s founding premise of making specialized custom forklift attachments that address the specific requirements of the customer.